The Alpsee is a lake in the Ostallgäu district of Bavaria, Germany, located about 4 kilometres southeast of Füssen. 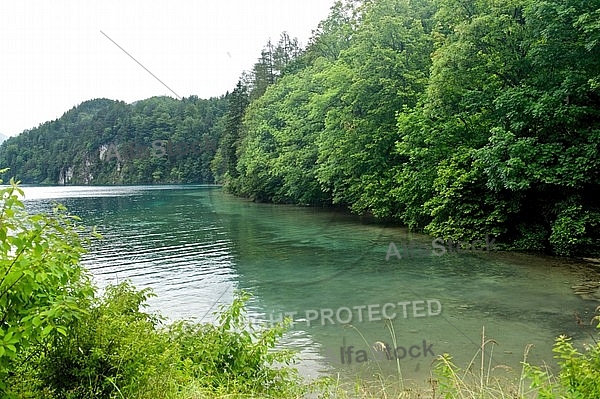 It is close to the Neuschwanstein and Hohenschwangau castles. The lake has just under five kilometres of shoreline and a depth of up to 62 metres. It is a popular tourist attraction, given its proximity to the castles and the wild swans that inhabit the lake. Boats are available for rent and there is a wide variety of hiking trails in the vicinity. A circular path leads around the shore, and the Fürstenstrasse Princes' Road leads from Hohenschwangau over the Schwarzenberg ridge and down to Pinswang in the Lechtal.